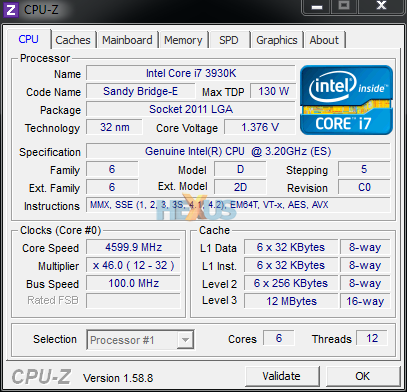 6 Cores, 12 Threads @3.2GHz, Sandy Bridge-E. 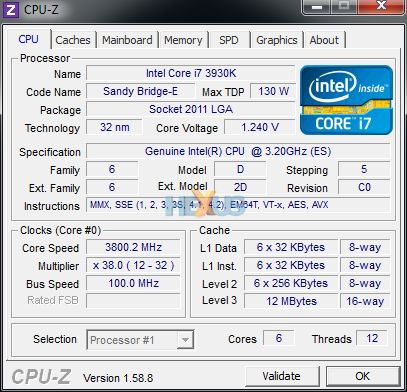 The Intel Core i7-3930K averaged 23.2% lower than the peak scores attained by the group leaders. This is an excellent result which ranks the Intel Core i7-3930K near the top of the comparison list. The range of scores (95th - 5th percentile) for the Intel Core i7-3930K is 31.5%. This is a relatively narrow range which indicates that the Intel Core i7-3930K performs reasonably consistently under varying real world conditions. Typical Core i7-3930K Builds (Compare 3,841 builds) See popular component choices, score breakdowns and rankings. Recycle bin rescue - worth the effort. Only $100 worth of 32GB DDR3 and traded a won 8086k for a 1070 Ti. After six years massive use it is flawless. My i7-3990K came alive - Corsair watercooled - on 1-st January, 2013 in a 2066, x99 Sabertooth TUF. No OC ever. The only modification in the build: Nvidia 6800 Strix gtx replaced by 1080 Strix. As far as FHD no game is a real match. Occulus rift ( DCS World, AC Competizione and the likes ), PS with several hundred Mb files, Studio 22... etc. all go like a charm. I am about to put together a new build. Sometimes I wonder why. Bought it for 120$ used this year and managed to put together an 800$ 6 core build. It delivers outstanding multicore performance and I have not had a need to overclock it yet. Not worth the money. Stick with the 3770K and save half of your cash. Cheers I do multi tasking, video rendering , I plan to upgrade but this chip can go to 5.2ghz its ran 4.8ghz since day one no troubles and still get faster speeds then the majority of the newer cpus. Just lucky I could a good OC chip. I couldn't get past 4.7 at first till I watercooled the mosfets. Love this baby. I have it up to 4.8 ghz with an AIO water cooler. I mean, this thing is flippin fast, testing above the level of a 7700k stock. I disabled HT...and man am I glad i did. 6 cores and 6 threads is MORE than enough for anything really. Pretty good considering i got this for freezies! My 3930k has been easily overclocked to 4.7GHz and has running well at that same clockspeed for ~5 years. Still holds up extremely well and manages a 98.8% Gaming Score compared to a standard 108% Gaming Score for an 8700k. Served me well for years, 6 cores 12MB L3 cache. Easy to OC, performs as well as a 7700K for an 8-year-old CPU.